Annie Sebastian Post Graduate Scholar, Department of Panchakarma, Sri Dharmasthala Manjunatheswara College of Ayurveda and Hospital, Hassan, Karnataka, INDIA. Muralidhar P. Pujar Professor, Department of Panchakarma, Sri Dharmasthala Manjunatheswara College of Ayurveda and Hospital, Hassan, Karnataka, INDIA. Meenakshi Malik Post Graduate Scholar, Department of Panchakarma, Sri Dharmasthala Manjunatheswara College of Ayurveda and Hospital, Hassan, Karnataka, INDIA. Unique Sharma Post Graduate Scholar, Department of Panchakarma, Sri Dharmasthala Manjunatheswara College of Ayurveda and Hospital, Hassan, Karnataka, INDIA. Yuvana Pidaka (acne vulgaris) is one of the most common, troublesome and frustrating skin care problem for people around the world. It is caused by to Kapha, Vata and Rakta Dhatu involving Rasavaha and Raktavaha Srotas. Apart from others unhealthy life style is identified as the major reason behind the eruption of such lesions. It has adverse effect on self esteem of the subjects and decreases one’s self confidence. Present study tries to understand the therapeutic effect of Mukha Lepa - an external application of Manjishta, Chandana, Yastimadhu and Kushta over the face mixed with milk once every morning for fifteen days after Sadhyovirechana with Avipathi Churna. Study was conducted on ten subjects and assessed with the parameters like Ruja, Kandu, Daha, number and type of eruptions before and after the procedure. The response to the treatment was recorded and the therapeutic effect was evaluated by statistical tests. A considerable change in the complexion over the face of subjects was also noted. It is observed that this particular Lepa is beneficial in the treatment of Yuvana Pidaka apart from improving the complexion of the skin. SEBASTIAN, Annie et al. MANGEMENT OF YUVANA PIDAKA USING MUKHA LEPA. 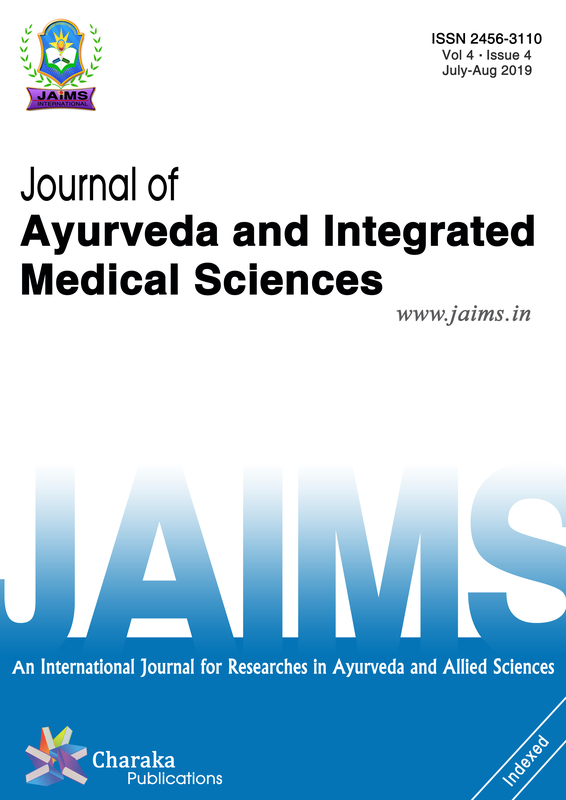 Journal of Ayurveda and Integrated Medical Sciences (ISSN 2456-3110), http://www.jaims.in/index.php/jaims/pages/view/Citation, v. 4, n. 1, p. 07 - 11, mar. 2019. ISSN 2456-3110. Available at: <https://jaims.in/index.php/jaims/article/view/744>. Date accessed: 25 apr. 2019. doi: https://doi.org/10.21760/jaims.4.1.2.